…and best of all, health and beauty for life! Take a look at our various cedar tree options and pick what's right for you. Hear what our clients' have to say about our service and product. What variety of Cedars do you grow? What kind of cedar trees should I purchase? The type of cedar trees you should get will depends on a number of factors. Linear coverage of the area to be hedged is a big consideration. 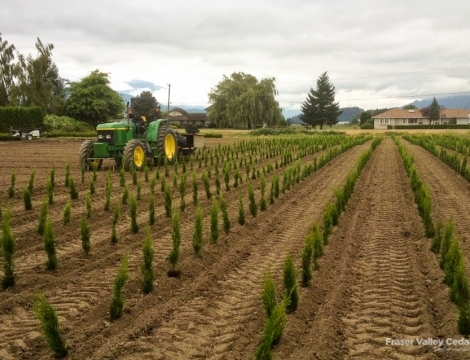 If you live on acreage and have several hundred feet to hedge you may consider planting an Excelsia Cedar (Thuja Plicata) as it is very wide and fast growing and much more cost economical as they don’t have to be spaced as close as other kinds. You must also consider how wide the cedars will eventually grow in relation to your yard. Most customers of ours in the past have purchased the Emerald Cedar (Emerald Green Arborvitae) given the tight/narrow growing characteristics which is ideal for most backyards and along fences. They are very easy to maintain needing a trim only once per year. There may be other factors unique to your specific landscaping job best seen only in person by one of our sales associates. If this is the case please call or email us to set up a time to talk in person or over the phone to better guide you in terms of what type of cedar tree to buy. Click here for more information. What is the turnaround time between placing an order and when they are ready for pickup/delivery? Order times depend on the size of the order as well as the time of year and how busy we are. Typically, upon receiving an order it takes 1-2 days to dig and deliver (local areas only). We can handle about 500 – 600 trees per day during peak times. Delivery outside the lower mainland could take 3 days to one week. Click here to contact us! If I plant cedar trees myself how will I know if I am doing it right? An improperly planted cedar hedge could lead to pre-mature death and/or discoloring. It is critical that it be done right from the start. We do provide general advice on how to plant your cedars properly so that the cedar trees take root and grow well. We also provide installation services which help ensure against premature death so we essentially take the risk out of the buying decision for you. Give us a call, we'll answer all of your questions! What time of year is best to plant a cedar hedge? The best time of year to plant cedar trees is generally cooler months (September to May). In general, digging during this time will usually inflict the least amount of shock to the cedar trees creating a higher success rate. When the soil is moist, trees come out of the ground with tight, compact footballs necessary for transport.